Gertie's lights all removed and boxed up. The indicators are rusted to the wings so the bulb holders will be staying put. 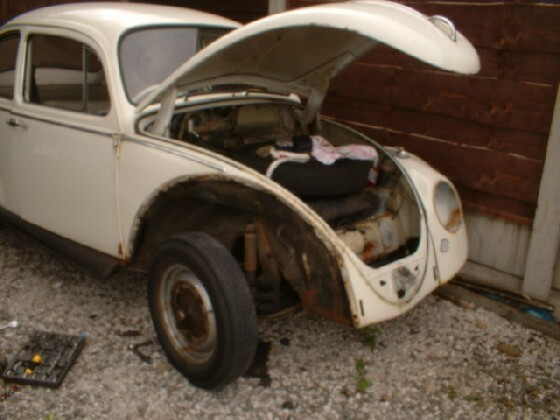 Hubcaps removed; seem to have lost my socket set when we moved house so we can't get to the wings & running boards yet. Carpets, side & interior trim and seats out. Dashboard trim packed up, carpets in the bin. New two tone gray seat covers and silver-grey carpets will be ordered in a few weeks. Whilst the floorpan looks like its seen better days its [amazingly] solid, just a couple of holes under the seat and the normal rusty hole near the battery. 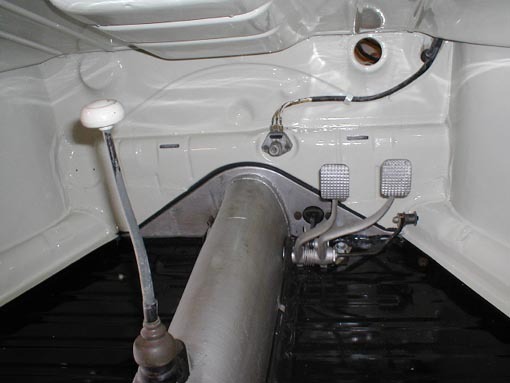 However it will be replaced during her restoration along with the heater channels. The front wings are off... The passenger side wires to the headlamps are intact but unfortunately I had to cut the headlamp wiring on the drivers side; four connectors will fix this though when she gets her lights back. The metal around the inner arches isn't good, there's a few holes and whoever patched her up in the past made a mess, as well as bolts holding the wings in place there were a few self tapping screws...! Looks likes she's been in a minor front end bump, the spare wheel well has some creasing at the front. 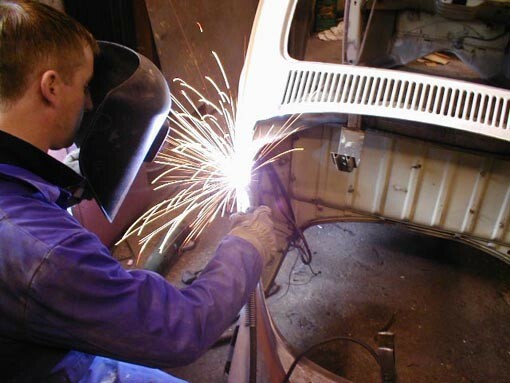 New heater channels, floor pan halves, front quarter panels and fabricated sections welded in the front bulkhead guarantee Gertie will pass her MOT inspection and provide us with many more years of enjoyment. 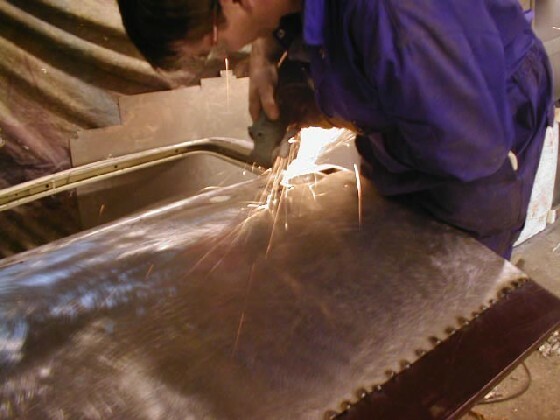 A few coats of Hammerite paint on the chassis will ensure the rust doesn't return. The spare wheel well has be completely rebuilt. 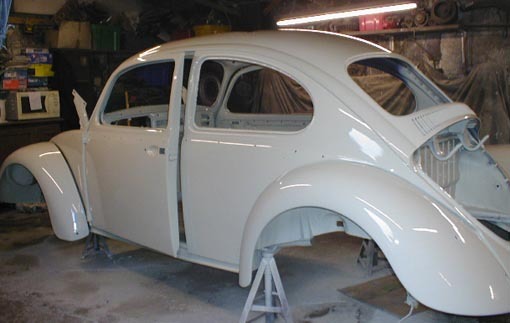 Complete new genuine VW front quarter panels, apron with cutouts for US Spec bumpers, spare wheel well and handmade recess for the brake fluid gives Gertie a 75% new front end. The rear quarter panels are in quite good shape so a few well placed repair panels (wing & bumper mounts and lower side panels behind the doors) solve the rust. The off-side has been stripped and similar repairs await. 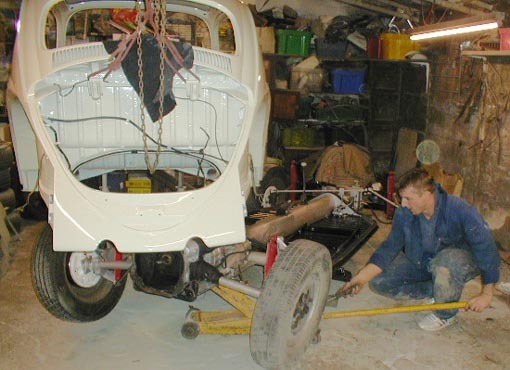 The chassis was separated from the body on the 31st August 2004, after only 4 days its almost finished. The double circuit brakes have been installed along with new brake drums and stripped /painted back panels. 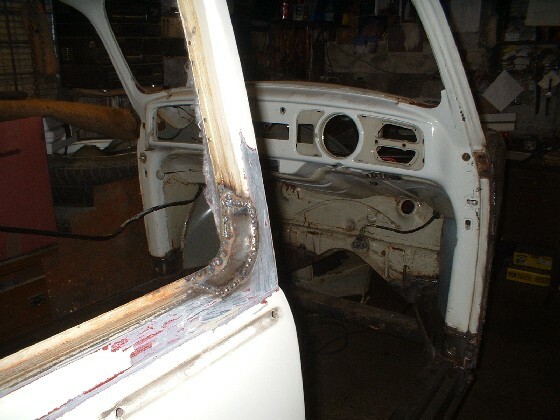 Everything has been cleaned back and coated in rust proof paint along with the floor pan and chassis. 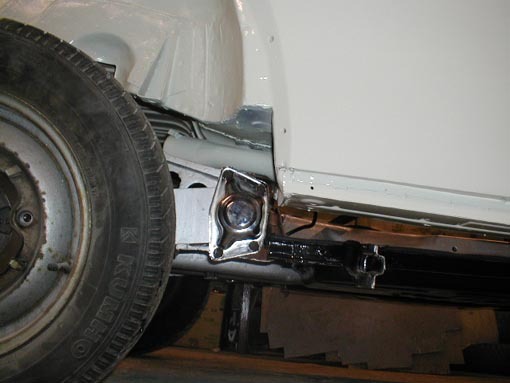 The new front link pin axle is in place, and it's been converted to RHD. Next steps for the floorpan are completing the brakes and painting the underside. Gertie's body is sat alongside supported on a stand. Fairly soon the hole will be cut for the Britax sunroof and then the body will be prepared and painted whilst off the pan. 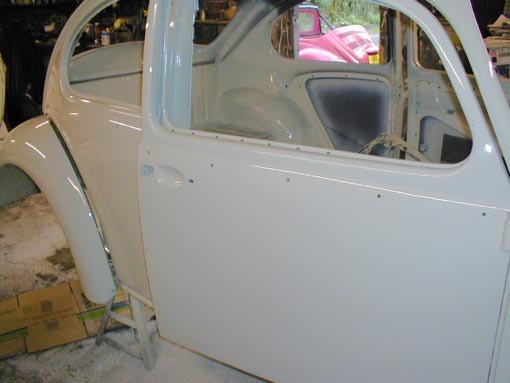 Its been a very eventful week in Gertie-land; the sunroof hole has been cut and most of the old paint (3 layers, beige, red and white) has been removed. The sunroof has been fitted on a test run and looks and fits great; its really fantastic to see the project taking shape, won't be long now until she's roadworthy and looking like a new car again; just as she deserves. 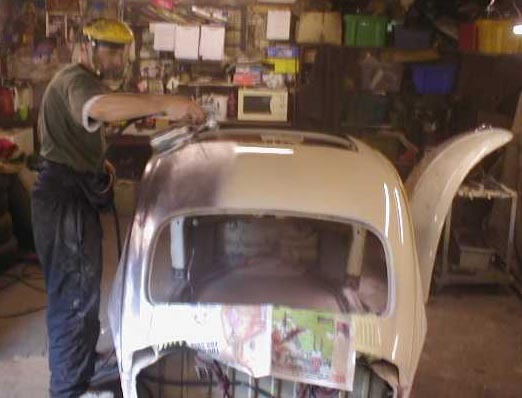 Next door's Tracy came to see Gertie today and couldn't resist helping with the paintwork, or at least painting her name and the date inside the rear quarter panel...! 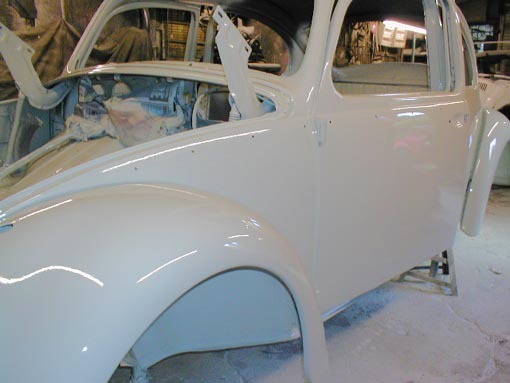 All the paint has been stripped from the front hood, the deck-lid is currently being stripped and Gertie's rear underside has been primered. 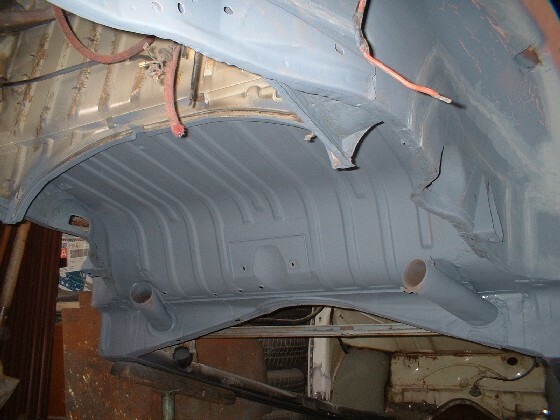 The engine bay is being prepped for paint, the joints being sealed and the roof & wings have been painted in primer. These shots were taken on Friday 8th October 2004; just after the paint - don't touch, she's still wet...! I dropped the lights, seals and other bits off, a good opportunity to see if the new lights fit...! Tracy came along again today along with little Harison; we got the spanner off him just in time...! Come home Gertie... almost ready, should only be a few weeks now. The paint is dry, wheels stripped ready to be painted, and looking like a car again. Are we happy...? Yes. 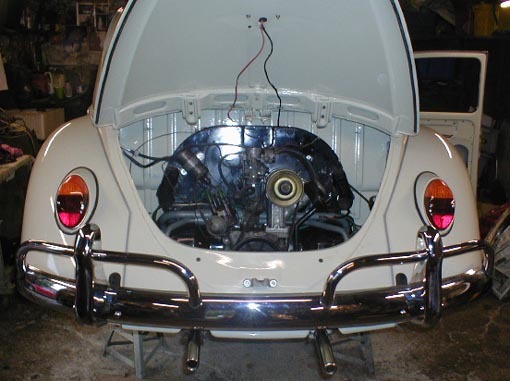 The view I had when I arrived at the garage this evening, a new beetle and an old engine. Chris Gilley will be working on getting the engine running over the next few days and cleaning up the tin-ware. We decided at the beginning that Gertie would initially run her original engine. Dependant on the power she'll most likely get a shiny new 1600cc, twin-carb engine Summer 2005 along with front disc brakes. The interior has most of it's dash trim in place and a freshly painted steering wheel. The original chassis ID plate has been cleaned up and is worn once again; "Made in Germany". The headlamp interiors have been painted Pearl White, just like the exterior - and they shine when you pull the knob. What a beautiful sight, compare these pictures to the 'Meet Gertie' page. The lights work, the towel rail bumpers are bolted in place and once again she proudly wears her British Registration Plate. If your wondering what is between the number plate lamp and plate it's the third brake lamp I found on 'TheSamba.com'. That's Pete, Chris Gilley's dog. The dogs will be happy to know both Pete and his mate (not in the picture) have been involved in the restoration.